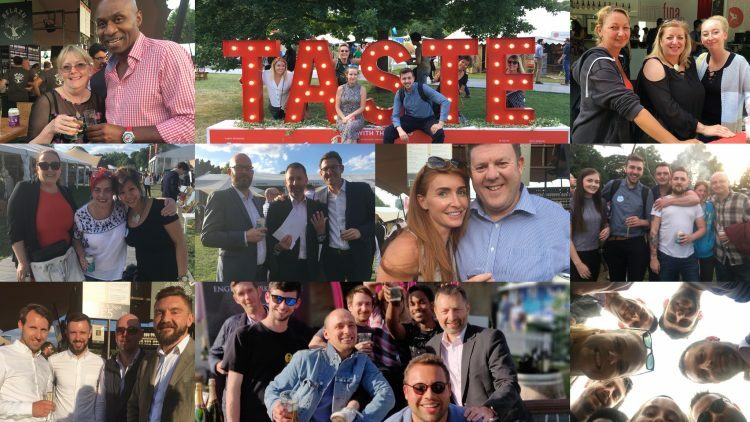 This year, we were delighted to host over 250 bartlett mitchell team members and clients to Taste of London in Regent’s Park – enjoying the best of London’s food, drink and company! For our inner FOODIES and for those who haven’t been Taste this is a sprawling restaurant and drinks festival, where old and new London restaurants sell mini tasters of their signature dishes. Many see Taste in mid-June as the start of all the summer season of events in and around London. Some of our organised team members had planned their evening attending the variety of demos, tastings and cookery classes. It was fabulous hearing our chefs enthuse about the new Fire Pit stage and to meet the chefs behind their favourite eateries. A real privilege for bm to enable that. It is important for our Chef teams to see and taste food from new and old restaurants, with Ikoyi, Barrafina and El Pastor all making their debuts at Taste this year. I was reliably told that over 40 restaurants attended this year, it’s always so difficult to have a favourite! The bartlett mitchell area “chatter” mostly revolved around; El Pastor, Smoke & Salt, Barrafina, Hoppers, Bao, Club Mexicana, Rokos and Club Gascon. We find this event supports the development of our Chef teams in a different way to our significant classroom or kitchen training. As they are the future of our business and the market,we need a broad and exciting exposure – Taste is great for that! In between the restaurant stands, it was fun to browse over 200 artisan food stalls, selling excellent quality produce – Belazu (one of bm’s artisan ingredient suppliers) provided excellent Mediterranean nibbles of innovative antipasti, to compliment drinks. The World Class bars were running a series of thirst-quenching events including rum, scotch and vodka mixing classes. Scotch lovers were treated to the Whisky Room experience which was a recreation of Johnnie Walker’s original, 200-year-old grocery store – who knew. Without sounding too critical, some of our group constructively commented on the danger of continued increase in artisan drinks stalls versus food which is our main focus, feedback to organisers given. However, most were happy to enjoy both food and drinks with equal gusto making for a lovely evening had by all.